Welcome to the Home of the Cavalier Cowboys. 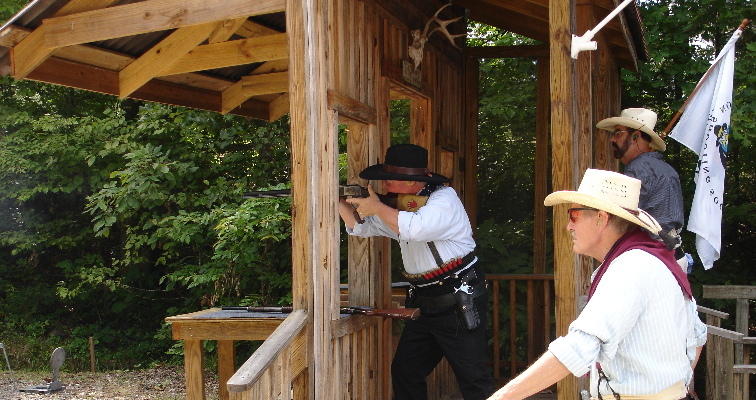 The Cavalier Cowboys are a Cowboy Action Shooting Club based near Montpelier, Virginia. 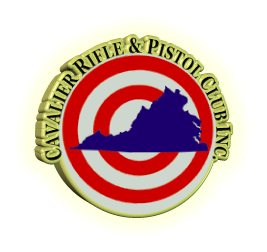 We are associated with the Cavalier Rifle & Pistol Club which is where we hold our matches. We shoot on the 1st Sunday and 2nd Wednesday of every month, with some exceptions. The Cavalier Cowboys are a SASS (Single Action Shooting Society) Affiliated Club, we are governed by and operate our matches under all SASS Rules. 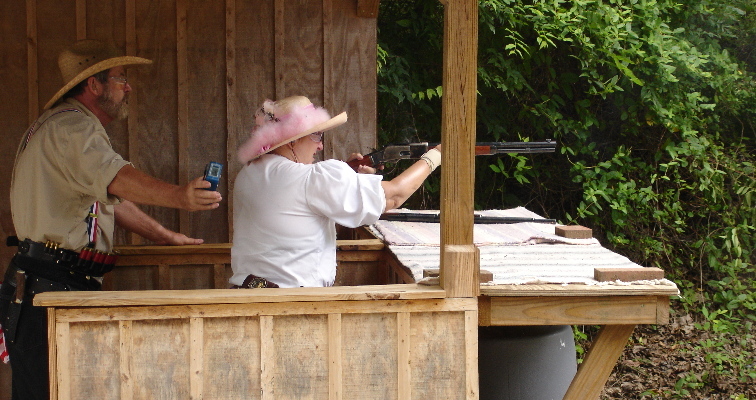 You DO NOT have to be a member of either Cavalier Rifle & Pistol Club nor SASS to shoot with us, everyone is welcome to join us as our guests. NEW Shooters are Welcome and Encouraged!! 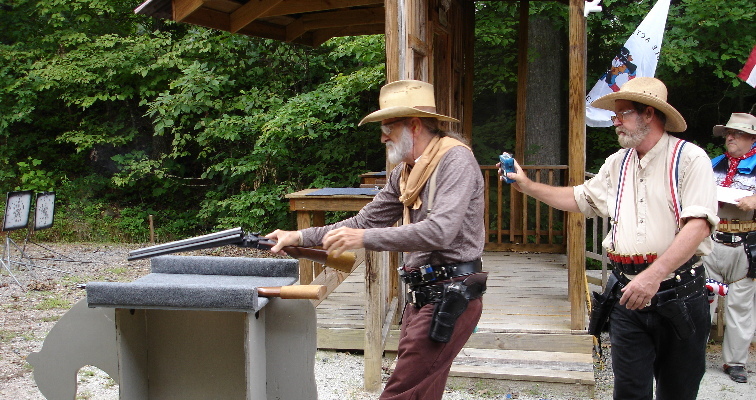 If you have ever wondered how much fun it is too dress up like a cowboy and shoot 1800 era pistols, rifles and shotguns at steel targets then COME ON OUT and find out!! 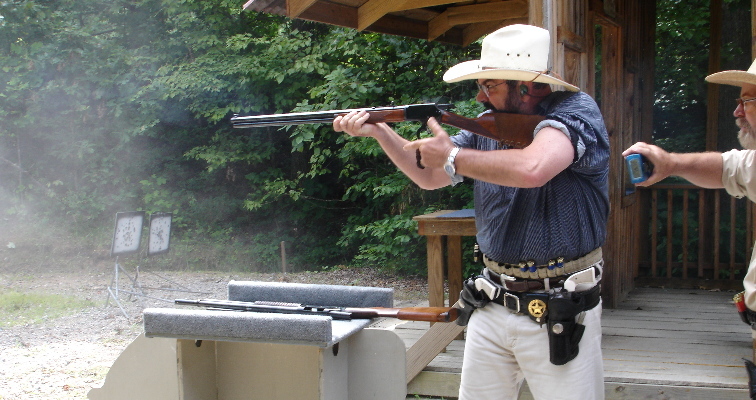 New Shooters need to have observed a full match (at Cavalier or elsewhere) before shooting their first match. 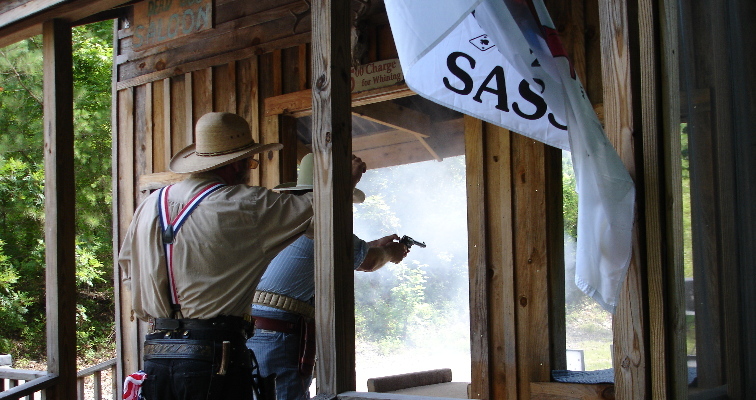 The 2018 Gunfight at the Double-C will be held on Saturday April 13th and Sunday April 14th, 2019 at the Cavalier Rifle & Pistol Club. This match will be our 5th Annual Two Day Club Championship Match. We are inviting all of our cowboys friends to come join us for two days filled with cowboy action shooting, good food, awards and the most important thing, cowboy fellowship. Like I said in a earlier email, the cavalier Cowboys will be holding their regular 2nd Wednesday of the month match this Wednesday April 10, 2019. Gates open at 10 and first shot down range at noon. All are welcome. Stages for the match are attached. 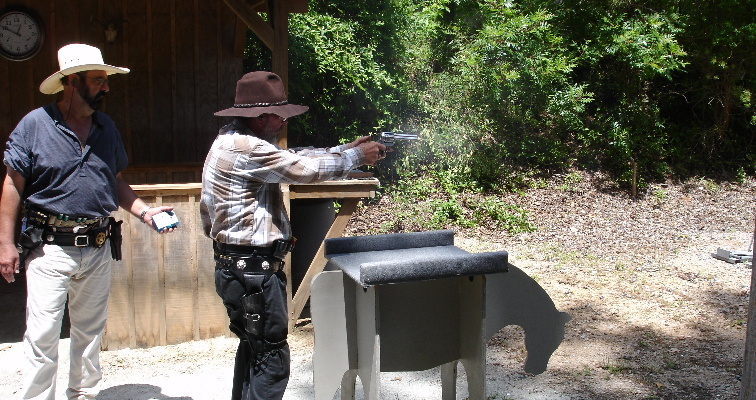 Back by popular demand, we will be holding our Cowboy Social at the range after Sundays match. If you can’t make the match on Sunday then you still have time to practice for the Double-C match held the following weekend by shooting our second Wednesday of the month match on April 10. Seems Cavalier is just a bonanza of shooting opportunities. All are welcome. Stages are being processed for Wednesdays match as we speak and will be forth coming. The Cavalier Cowboys will be holding their 1st Sunday of the month match this Sunday, April 7th. Gates open at 8:30, safety briefing at 9:45 and first shot down range at 10:00. Hope everyone can make it. Stages are written by Smackwater and are attached. Sorry you had to work today or just decided to sleep in because it was a good day for a match. Weather today should pretty much mirror what we will experience this weekend at Gathering on the Mattaponi. We finally wound up with 9 shooters today and with stages like we had, it could of been 5 or 6 shooters. Actually, the twist in the stages made for a very fun afternoon. Sadly, we only had one clean shooter and that honor goes to VA. Rifleman the one and only. Thanks guys for all the help. 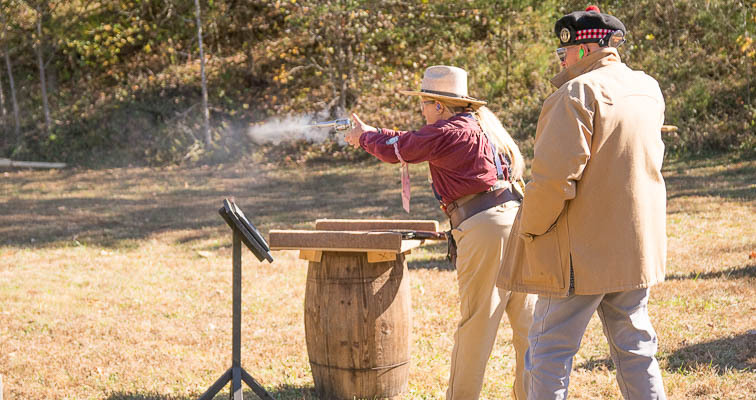 PS – Speaking of this weekends Gathering on the Mattaponi, you can just bring your registration to the Double-C match with you and save a stamp. See all of you this weekend. Time to dust off your Wednesday ammunition and shoot up some targets again. Winter is on the way out and Wednesday matches are on again. The Cavalier Cowboys invites you to come on out this Wednesday, 3/13/19, and have some fun. 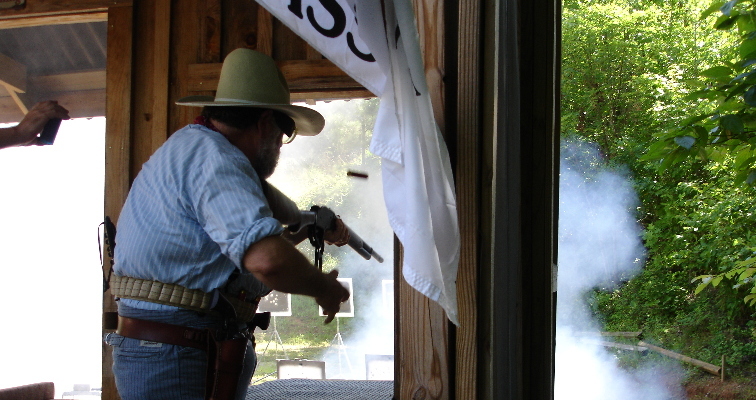 Gates open at 10 am for set up and first shot down range at high noon. Speaking of high, the temps for Wednesday is around 54 with 4 mph winds. Not to bad, not to bad at all. Hope to see you then. Don’t forget to set your clocks forward this Saturday night. Sorry for the late scores but I have been having problems with Google groups. Hopefully it is fixed. It basically stayed about 45 all day from beginning to end but with no breeze, it felt a lot warmer, especially next to the fire barrel. Never rained but a light damp mist keep us under the canopy’s high and dry. We had 9 shooters shoot todays match and 4 of them shot clean. Those shooters were One Eyed Jane, Ham O’Royd, Smackwater and myself Major BS. I really want to salute the work ethics everyone showed to make this match a success. The Cavalier Cowboys would like to invite you to our regular 1st Sunday of the month match this Sunday 3 / 3 / 19. Gates open at 8 am and first shot down range at 10 am. It’s gonna be a little coldish so dress warmly. The fire barrel and hands heater on the loading table will be cranking for your comfort. The stages have been written by Ripsaw and we will be shooting the one bay setup instead of the two. Also, I hope you like our new parking. Please ignore the date on the attachment. Did some swapping for a one bay setup. Was this January weather or April weather. What a lovely day to shoot something. We were missing a few people today. Our thoughts and prayers are with you Mr. Prairie City Slim and MS. One Eyed Jane. Slim, hope you have a fast recovery. Hopefully we will see you and Jane by the next match. Are you ready for your best shooting year to date. 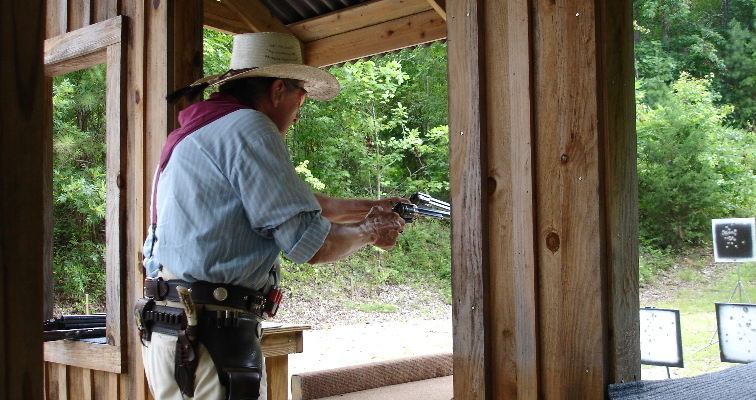 The Cavalier Cowboys will be starting this new shooting season next Sunday, Jan. 6th 2019, our regularly monthly match date. Gates open at 8:00 am, safety briefing at 9:45 and first shot down range at 10 o’clock. Heat will be provided. With the colder temperatures we will hold our cowboy social at the Mexican restraint just off the corner at Oilville and 250. Stages are attached and are furnished by our pard, Ripsaw. Well, we have been bitten by the winter bug. With 8″+ of snow still on the ground and the roads to the club still quite icy, the match for tomorrow is a NO go. There will not be another Wednesday match until March unless we have a freak warm weather event. The Cavalier Cowboys will be having their second Wednesday match this Wednesday, Dec.12. This will be our last Wednesday match until the winter passes and will resume again in March. Weather forecast for the match is supposed to be in the mid to upper 40’s and sunny so it will even feel warmer than actual temperatures. Gates open at 10:00 with first shot at 12 noon. Attached are the stages – trying something a little more different. It was a little cold today but without the wind blowing it was comfortable with the help of a pair of long johns . With the crowd we had today I just can’t understand why we didn’t have a single clean shooter but o” well, stranger things have happened. I would like to congratulate Cody as our 1st place shooter, BS, me in second place and Ripsaw coming in third overall. I’d also would like to thank Ripsaw for bringing his neighbor Gary to watch his first match and he got to shoot a couple of stages to boot. Thanks Gary for helping out. The results from today are attached. The Cavalier Cowboys will be shooting this Wednesday Nov.14th. Gates open at 10:00 for set-up, safety briefing at 11:45 and first shot down range at 12:00 noon. Looks as if it will be dry but a little cold so dress appropriately. Hope to see you there and as usual, stages are attached.